Aditi Raychoudhury, Architectural Energy Corporation, San Francisco, California. The scope of the Transbay Transit Center Extension project is anticipated to generate 125,000 trips a day through the center that will support a dynamic mixed-use neighborhood. 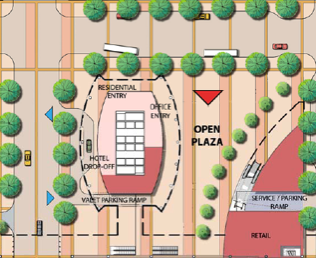 The development plan provides a pedestrian environment with services, restaurants, entertainment and retail for use primarily by financial district workers, commuters and the local residents. In addition, a proposed tower will accommodate hotels and offices. Needless to say a project of this scale would have an enormous environmental impact and part of the process involved setting a sustainable design standard for the participating designs. I developed a series of sustainable design goals, concepts, case studies and guidelines to create the sustainability framework and approach for the project. The sustainable design criteria were integrated with other general design concerns (such as revitalization, and providing pedestrian space). I also developed a matrix-based scorecard to simplify the process of evaluating the sustainability commitment of the competing design proposals for the new Transbay Transit Center Building Project. These guidelines and matrix were included in the Request For Proposal to promote innovation, communication and provide a working tool that would aid potential project designers in planning, design, and construction of new buildings and renovations with an appropriate level of attention to economic, ecological, and social concerns. The existing Terminal, constructed in 1939, is in need of retrofit, revitalization and expansion to accommodate additional transportation services, housing, shopping and entertainment to generate additional business in the area, which is currently blighted. 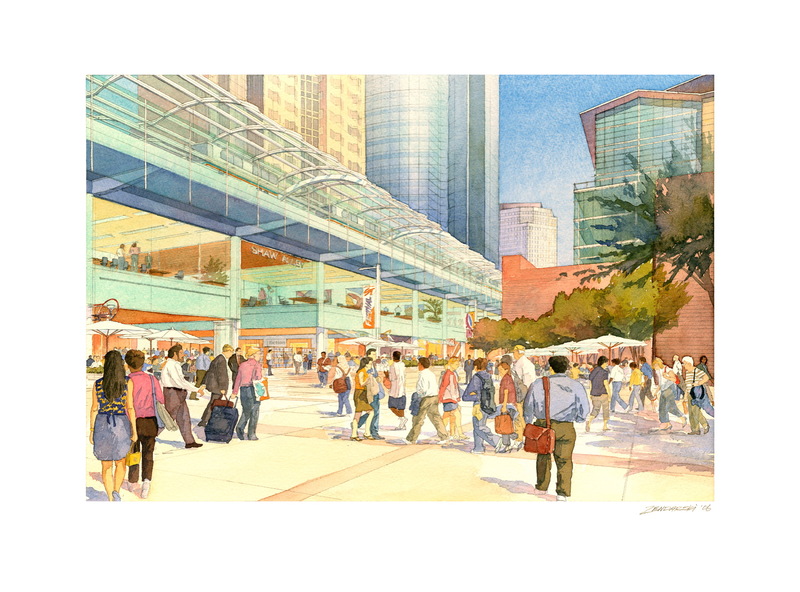 The development plans for the Transbay Transit Center, San Francisco, will incorporate improved regional bus service, seamless connections to BART and Muni, a future Caltrain and high-speed rail to link all corners of the Bay Area and major west coast cities to downtown San Francisco. The Transbay Transit Center will provide a symbolic and physical gateway to San Francisco and also bridge the major routes between the financial district and the Bay Bridge. The Transbay Transit Center Parcel, which includes the existing terminal and its immediate surroundings. It will be completely demolished, and replaced with a new multi-modal transit center with expanded transportation services, commercial uses supporting pedestrianization and revitalization of the surrounding neighborhood. The Transit Center will be publicly owned and funded. Hence, long-term sustainable technologies, that typically have relatively long payback periods such as photovoltaics or storm water purification systems, were strongly recommended. The Transit Center is also envisioned to rely almost entirely on natural ventilation to save energy and purify the indoor environment. 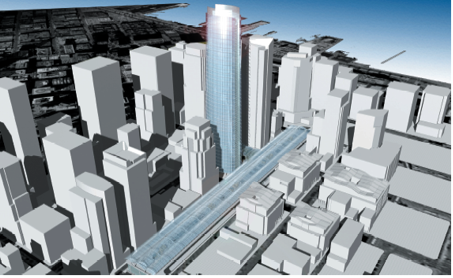 The Transbay Tower Parcel, which includes a proposed new 850’ high Tower building to accommodate approximately 1,250,000 s.f. in mixed-use functions, such as, retail, offices, hotels and residential uses. It also includes a covered plaza or winter garden. This parcel will be developed privately. Hence, sustainable technologies with shorter payback periods, such as efficient lighting and air-conditioning systems, high performance glazing and insulation, which reduce operating costs of the project, were strongly recommended. Needless, to say a project of this scale will have a huge environmental impact, which the project aims to minimize through the stringent sustainable design criteria that ranges from local to regional issues, such as community character, water use and quality, land use, energy use, and ongoing operations and maintenance costs, resource efficiency and global warming. 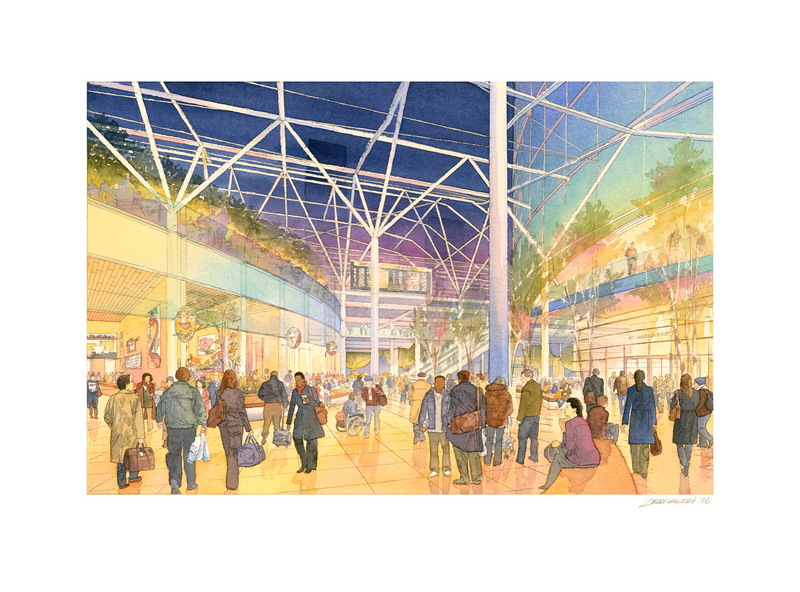 A ‘good neighbor’ that would introduce an attractive, open, healthy pedestrian environment, such as the ‘winter garden’, by providing solar access and wind protection in open spaces in the form of a winter garden, plaza or park and a development that would reduce source energy use and greenhouse gas emissions. An ‘urban catalyst’ that would enhance the vitality of downtown San Francisco by creating a sense of neighborhood, and encourage pedestrian traffic by creating streets, housing and other entertainment opportunities and leisure such as cafes and retail shops. An ‘natural energy collector’ that would use and enhance the natural elements and sources of renewable energy to power various functions in the building. These functions would include using aerodynamic forms to harness wind energy through the building for natural ventilation, as well as optimizing building orientation to maximize daylighting in the interior zones. A ‘regenerator’ that would incorporate on-site power generation through the use of photovoltaic panels, and water conservation through rain- water harvesting and recycling. The design criteria also included an exhaustive and detailed list of strategies from macro (urban and site development) to micro (materials, plants and building user interaction) and weighted them according to payback and applicability for each of the three project components, to simplify the process of implementation for the designer.